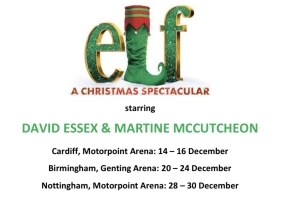 I am delighted to once again team up with my mate and creative partner David Essex, to present him in ‘Elf – The Christmas Spectacular’ at Cardiff, Birmingham and Nottingham in December 2018. Having presented David in various concert tours, ‘Boogie Nights 2’ and ‘All The Fun Of The Fair’ the following press release tells you all about our new venture together! We have allocated a number of priority and discount tickets exclusively available to you through the Jon Conway Productions website. We have reserved top price front three rows of seats in every venue at all performances, off sale to the general public, only available to you, his dedicated fans, until the end of April. We have also allocated seats at a DISCOUNT PRICE in the second and third tier price bands at every venue and performance of £10 OFF, for all tickets purchased before the end of May. You cannot book these through agents or venue box office. To take advantage of this exclusive offer, please contact my son Jordan Conway, who will deal with all of your ticket requests. Eagle eyed fans of Boogie Nights 2 may recall him playing 7 year old Young Roddy on film with David outside the gates of heaven! Full details will be on the jonconwayproductions.com website from Tuesday 13th March.